Maternity clothing is a necessity for just about all women. But there is so much more that goes into maternity clothing than just buying it and wearing it and that’s it. When to start purchasing clothing, how often to do it, along with what factors to considering when shopping for it are all valid questions that every woman should know the answer to. This article will go over all the key tips needed to successfully and efficiently purchase and wear maternity clothing during your pregnancy. When do maternity clothes become necessary? For most mothers-to-be, much of their regular clothing will still fit for the first three months of the pregnancy. However, once you start the hit the second trimester is when you can expect to start needing to wear larger clothing items. But this is not always the case. Some women develop their baby bump earlier on in the process. And some barely develop one at all throughout their entire pregnancy. And if you have twins, you can expect your bump to develop towards the faster side. The key here is to wait and see how your body changes, and only when you really see that you are starting to need new clothes do you go out and buy them. Every woman’s baby bump is different, but you can typically expect a noticeable one like this by the second trimester. Some mothers may try to save time and effort by buying all their clothes for the rest of their pregnancy all at one time. However, they often end up buying clothes that don’t fit them as well as they expected when they originally purchased them. This leads to them ending up having to go back to the store to buy new clothes that do fit them, which is exactly what they were trying to avoid in the first place. Mothers can never truly predict how their bodies change, especially looking so many months into the future for an event (pregnancy) that they most likely have never experienced personally. It is much easier to buy as you go. This is a great tip to help fill in some of your wardrobe gaps over the coming months if your partner is physically bigger than you. 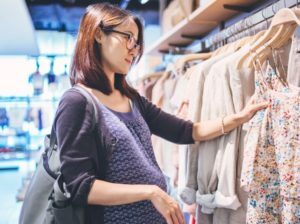 Oversized T-shirts and even some of their casual sweatpants or the like can be a good fit for your body at some point during your pregnancy, and so using their clothing can help you save some time and money shopping for more clothing. Not only is cotton the most comfortable material for clothing in general, it also has relatively high elasticity properties that are perfect for women who are constantly growing because of a pregnancy. In layman’s terms, cotton is designed to stretch – at least to a certain degree. This means that even as you start to get slightly bigger, your cotton clothing will stretch with you to give you even just a few more days of use, if not weeks. Even though cotton may be slightly more expensive, it is worth it for this property alone, not to mention that cotton is comfortable (more on that below). You can also look for Lycra material to get a similar stretch in your maternity clothing! As much as you feel like maternity clothing is not a big deal and that you shouldn’t spend too much money on them, you are sacrificing something that ultimately is more important in the long run in your overall comfort. Don’t forget that you are going to be relying on these articles of clothing over the next few months. Not to mention that you are going to be plenty stressed, irritated and emotional because of the hormonal imbalances you face while going through your pregnancy. You do not want uncomfortable clothing to add on even more stress and irritability to your daily routine. Whenever shopping for maternity clothing, prioritize comfort over price. Make sure when you go out shopping for maternity clothing to try them on for yourself. And if you wear anything that feels itchy or uncomfortable in general for you, don’t buy it. Along those same lines, if something really feels comfortable to you, you should make it a point to purchase it even if it is a bit pricey. If you really can’t get over the price, one solution is to commit to wearing it more often than the rest of your clothes, that way you are comfortable more often, and the frequency of wearing that article of clothing helps to justify the price. This has nothing to do with the weather (although it might apply to you depending on where you are living). We are referring to the fact that as you progress through your pregnancy, the hormone fluctuations end up changing your body from hot to cold and back to hot, multiple times throughout the day. With so many different “climates” that you need to be prepared for, having a multitude of light clothing that you can use to add layers or remove layers throughout the day is so valuable. Being prepared and buying enough clothing to layer helps to ensure that you are always comfortable, which as we’ve already mentioned is very important for a mother-to-be. While most of your maternity shopping will focus on tops that fit your growing baby bump, don’t forget that other parts of your body are changing too. Your breasts will eventually start to increase so you will probably need to purchase a few bras in a larger size at some point. And some women even experience an increase in feet size, which means that you may need to buy larger shoes that fit you as well. As always, just listen to your body and be simply be ready for unexpected changes to it and you will be just fine. This advice is mostly for women who are currently planning not to have another baby after their current one. You never know whether your perception on more kids having may change, so it is highly recommended to keep all your maternity clothes just in case. The clothes that you have bought over the last few months were most likely not cheap, and so throwing them away when you can never be 100% sure you’ll never need them again is not wise. The need to wear maternity clothes out in public sometimes comes with some negative feelings about your overall body image. However, most of those thoughts are unwarranted. The truth of the matter is that having a baby is something that a lot of women envy and something that most men will find attractive in and of itself (especially if you have that mother’s glow improving your overall complexion). To put it simply, it is something to be proud of! So be sure to follow our tips above, and above all else, be confident in how you look! Maternity clothing is an important and for most people unavoidable part of your pregnancy so be sure to make the most of it! Good luck!